The goal of this document is to describe a typical setup for Science On a Sphere and discuss very generally, the lessons learned while using Science On a Sphere in conferences, conventions, classrooms and presentations. The sphere size is 68" in diameter. Other sphere sizes are possible, but would require custom engineering (at additional cost to the SOS recipient). Description follows: The 68" sphere is built to come apart at the equator in two equal halves. There is one seam to hide and it's a very straightforward process to hide it. The 68" sphere is the sphere that we typically use for shows, conferences and conventions. The current version of these spheres weighs in at less than 50 pounds. The sphere is attached to the ceiling or suspension structure via a three-point suspension system. The cables are rated to hold many times the weight of the sphere. A three-point suspension system is used to hold the sphere in place and reduce lateral movement. If the sphere moves, then the images become un-focused. The cables are strong, yet small enough to blend into the background. The suspension cables come with the sphere. 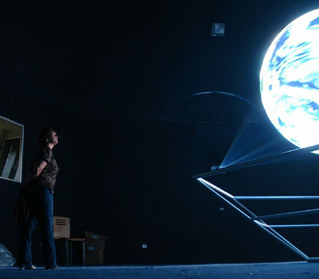 The sphere is positioned within an enclosure, surrounded by four video projectors. The locations of the projectors form a square footprint around the sphere. The distance of the projectors from the center of the sphere is based on the projector lens characteristics, but generally can be at a distance of 16' to 21'. Looking down from above, the sphere sits in the center of a a square box that can be formed by drawing lines between each adjacent projector. If "D" is the distance from the center of the box to a projector, then the lengths of the sides of this box can calculated by the formula: 2 x D / sqrt(2). It's important to realize that the distances are to the projector lens, often times the depth of the projector needs to be accounted for when fitting the projectors into a corner or other tight space. See the floor plan diagram (pdf) of the Science on a Sphere. As described, the projectors are at the corners of a virtual box with the sphere at the center. It is critical that the projectors are located at 90 degree angles from each other, relative to the center of the sphere. The projectors should be mounted in a way that allows for a 3-axis adjustment (x, y, z planes). In our lab and at most sites, we have successfully used standard projector mounts from Chief and Premier. The mounts can either be attached to a pipe coming down from the ceiling, a floor mounted truss, or attached to a wall (wall mounts are the last choice since it is easy to get projector vibration from wall mounts). The projector height needs to be equal to the height of the equator of the sphere, plus or minus 12" or so (please talk to NOAA before making assumptions about the projector height). It is critical that the projector all be on the same geometric plane and that the projector plane be parallel to the floor. Please look carefully at the floor plan diagram (pdf) of the Science on a Sphere. The height of the sphere is somewhat arbitrary however there are some best practices that should be followed. We have found through our numerous demonstrations, that the height at the equator of the sphere should be about 86" off the ground. This serves two goals, the first being, that that the projectors are also 86" off of the ground and this height somewhat minimizes the shadows that occur when an individual walks directly in front of a projector. This is clearly dependent on the height of the individual and their closeness to the sphere. The other goal served, is that the sphere isn't too high for viewers. By stepping back 4 to 8 feet, the viewers can still get a view of the northern part of the sphere, yet it's not so high as to not allow a viewer to walk up very close to the sphere and get a feeling of size, scale and proportions of the globe. It is generally recommended to have an audio system installed for SOS. There are audio components that include a mixer and a wireless mic. Out near the sphere, there are usually ceiling mounted / wall mounted speakers. The audio system is used to play audio tracks that accompany the sphere visualization and for a microphone system. The four-projector design of Science On a Sphere has some inherent limitations, the main one being the blackout areas at the top and bottom of the sphere. The blackout area amounts to a small square at the very bottom and very top of the sphere. This is the area where the light rays of projectors cannot reach from their current location. With the sphere at the recommended height, this blackout area is difficult to see and is generally of little issue even if someone happens to lean over and see the little blank area at the bottom. The projectors generate a small to moderate amount of noise due to the cooling fans. The projectors also generate a fair amount of heat for their size. The projector enclosure will have to maintain adequate cooling and ventilation for the projectors. The Dell computer systems generate very little noise, but a significant amount of heat from rear exhaust fans. The standard configuration consisting of two computers needs to be kept at an ambient air temperature somewhere below the mid 70's with adequate air flow away from the CPU cases. A carpet floor would be desirable for kids to sit down on and to help reduce sound echoes. Many times, when children come in for a field trip or are there as part of a tour, they immediately sit down on the floor. Generally presentations led by a facilitator involve the audience walking around the sphere. However, some audiences don't want to walk around the sphere and are content to just stay in one place. In several venues, we have had people that just come in and find a place to sit (usually on exhibit furniture). It might be nice to accommodate a few places for folks to sit down in chairs or benches even though these audience members won't get the same, rich experience. There might be an advantage to having some kind of smoked glass mirror on the inside of the enclosure. At one of the venues, we had a room that had T.V monitors and a wall of glass bookcases. Seeing the sphere reflected off the glass bookcases was very spectacular and seeing the sphere reflected in the curved glass of the black, powered off T.V. screens was even more amazing to see. Visitors are enthralled with SOS, so much so that they generally don't look at surrounding flat-panel displays with other imagery on it. Visitors are generally curious about the technical aspects of the sphere. Visitors liked the aesthetic value of the brightly colored data that was shown on the sphere. Visitors responded very positively to a live presenter to guide them through the data shown on the SOS. For these presentations the audience would stay for 40-min presentations.